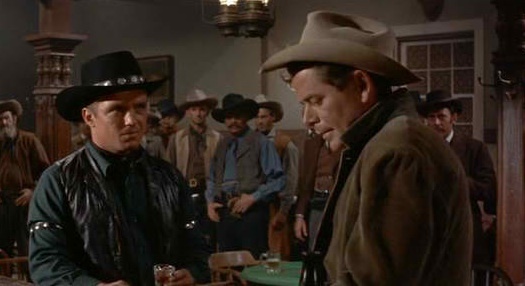 Sterling Hayden starred in several B westerns in the mid-1950s, sometimes venturing into more ambitious territory with more upscale films like The Asphalt Jungle (1950), Johnny Guitar (1954) and The Killing (1956), later even showing up in smaller roles in Dr. Strangelove (as Gen. Jack D. Ripper) and The Godfather (as a corrupt police lieutenant killed in a restaurant). 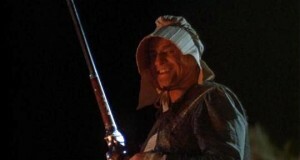 He was said to have been more interested in sailing than in acting. 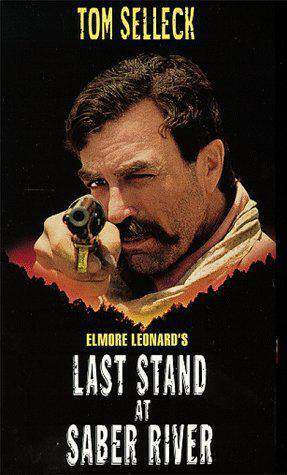 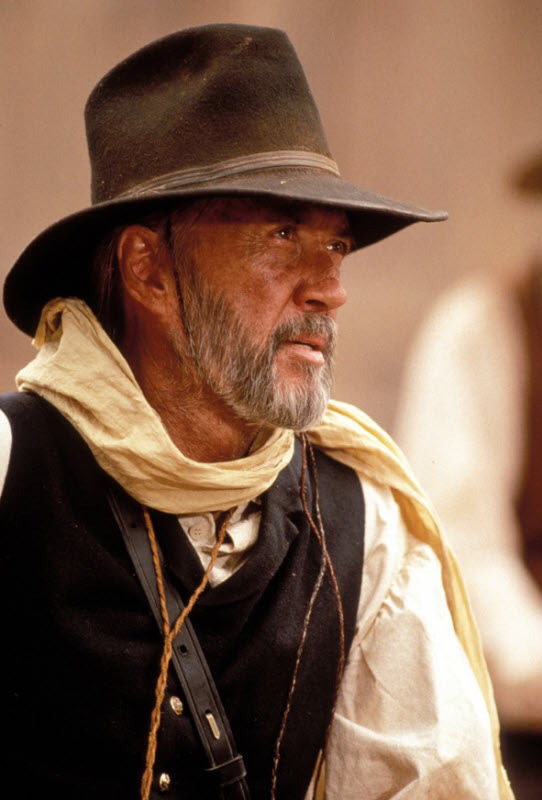 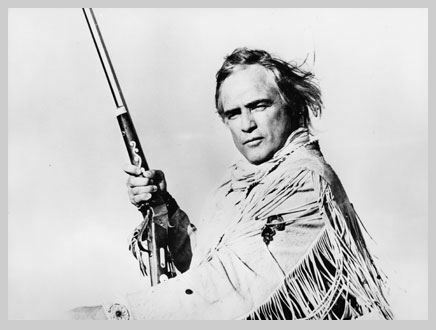 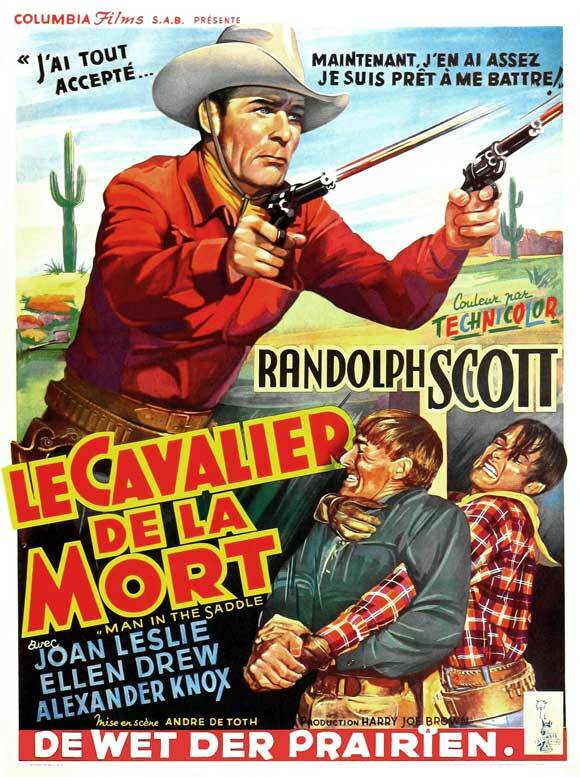 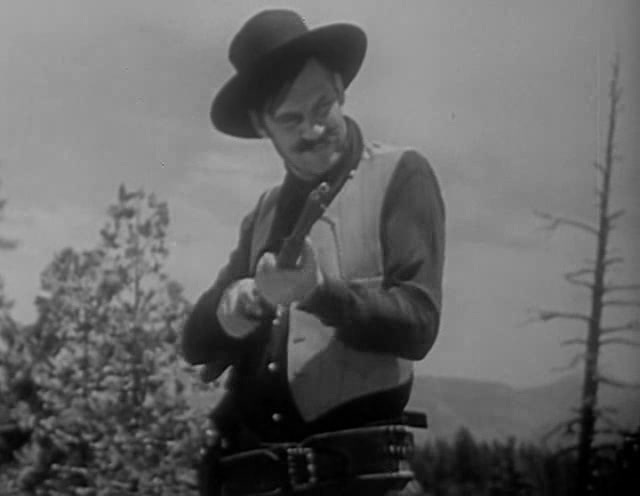 This low-budget effort is his last starring role in a western, and it’s also the last film directed by Joseph H. Lewis (Gun Crazy, A Lawless Street, 7th Cavalry), who was known for his style-over-substance approach to filmmaking. 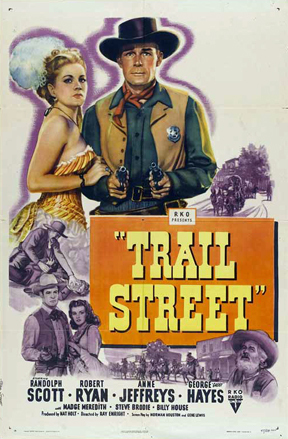 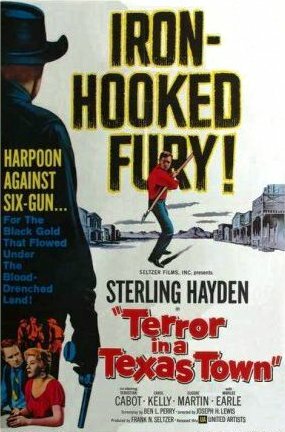 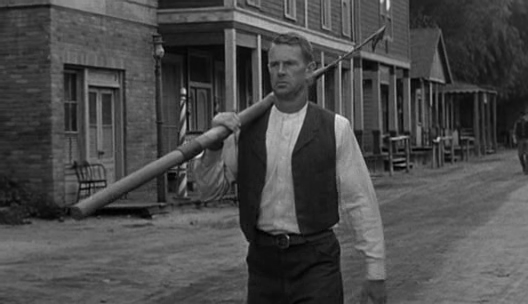 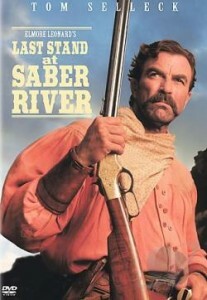 Some of that style is apparent from the opening scene, which shows Swedish whaler George Hanson (Sterling Hayden) marching down the dusty main street of the Texas town of the title without hat or gun, but carrying a whaling harpoon into a confrontation with a stereotypical black-clad, one-handed gunman, Johnny Crale (Nedrick Young). 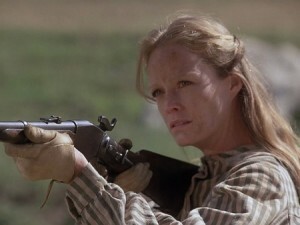 The rest of the story is told in flashback, getting us back to this point. 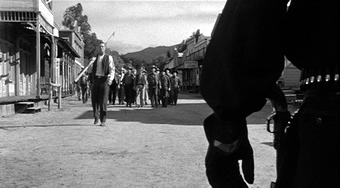 The opening scene sets up the final confrontation on a dusty Texas street. 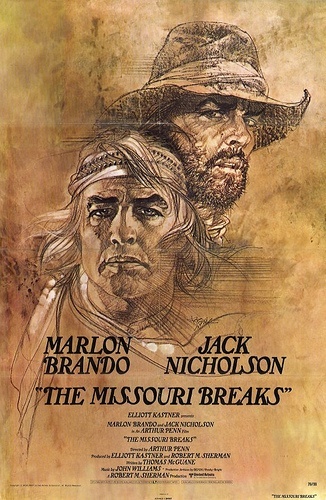 The outlines of the plot are not remarkable. 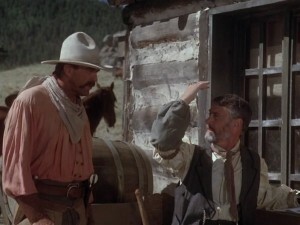 A wealthy man, Ed McNeil (Sebastian Cabot), has come to town, intent on taking over the surrounding land because it has oil. 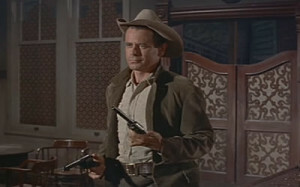 He brings in Johnny Crale, a gunslinger he has worked with before. Since then Crale appears to have lost his right hand and now wears one of metal with a glove, although his nasty disposition is intact. 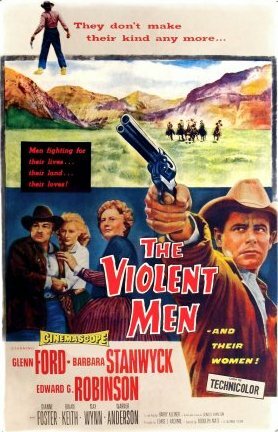 Among those who will not sell is Swedish immigrant Sven Hanson (Ted Stanhope in an uncredited role); and Crale coldly kills him. 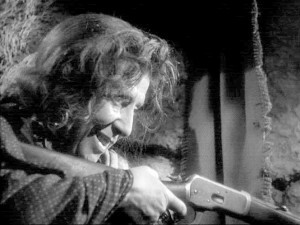 The killing is witnessed by Juan Mirada (Victor Milian), who keeps silent in part because his wife is expecting a new child any day,.and in part because it would do no good to say anything. Sven’s son George Hanson comes to town to visit his father. Although he is generally peaceable, he has progressive run-ins with Crale, whose men beat him and put him on a train out of town. 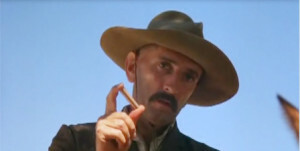 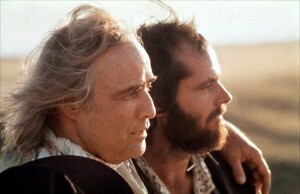 He returns and persuades Juan to tell the story of his father’s killing, until Crale kills Juan as his child is being born; the murder is witnessed by his own son Pepe. 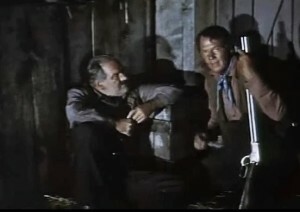 McNeil starts to see Crale as a liability and they have a falling-out, until Crale kills him, too. This brings us back to the opening scene, as George takes up the weapon he knows, a harpoon, and goes to meet Crale in the street in one of the most unusual western showdowns ever filmed. 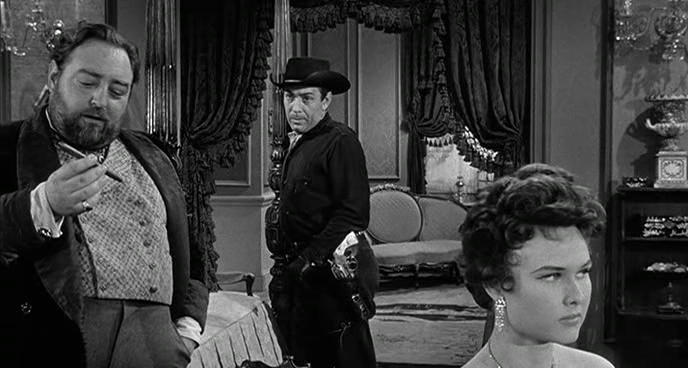 Land magnate Ed McNeil (Sebastian Cabot) negotiates with his enforcer Johnny Crale (Nedrick Young), while McNeil’s “secretary” listens. 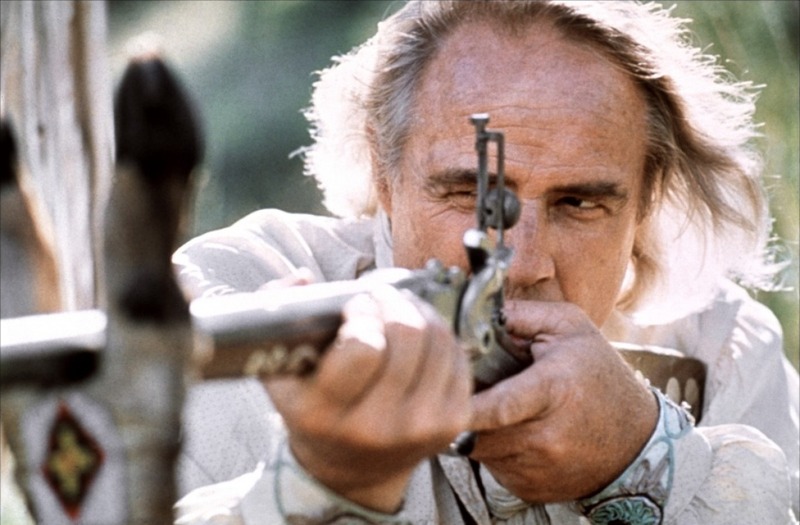 Hayden, who never looked much like the traditional western hero, does well enough as a Swedish whaler who can’t be pushed any farther. For once, devoted sailor Hayden got to play an actual seaman, even if in a western with no ocean. 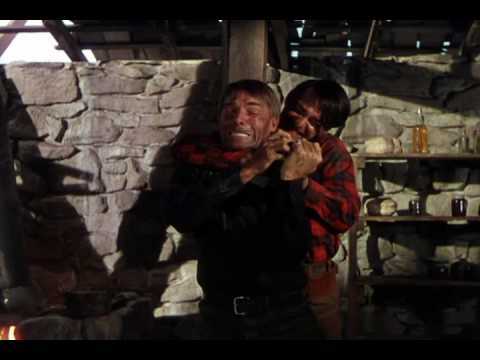 Sebastian Cabot is better than most range tyrants as the nefarious oil-hungry magnate. 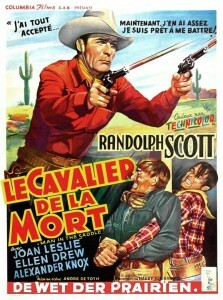 Kendrick Young is not entirely satisfying as the one-handed gunman, in a kind of stereotypically-written role. 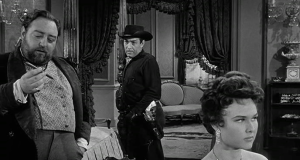 Victor Milian (who was in the film noir Touch of Evil the same year, but spent most of his career in television) does well as the Mexican witness weighing his responsibilities to his family against telling the truth about Crale. Director Lewis earns his reputation for style by constantly distracting us from the outlines of a routine story with unusual camera angles, lingering close-ups on weathered faces and disturbing editing. In general, virtue is not rewarded, nor are those who summon the courage to do the right thing (Sven Hanson, Juan Mirada). The psychologically-tortured gunman Crale seems almost as much a victim as those he killed–perhaps because his mother never loved him or because his crippled gun hand represents another kind of impotence. The whole thing has the kind of bitter aftertaste of, say, The Ox-Bow Incident, with justice coming out on the short end. This has become something of a cult favorite in some circles. 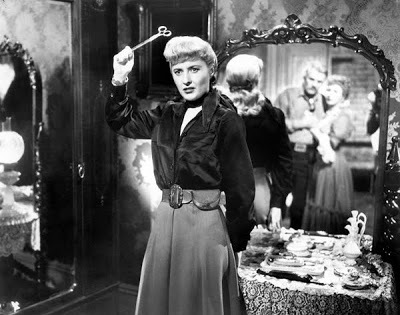 When the law fails, George Hanson (Sterling Hayden) uses the weapons at hand–in this case, a harpoon. 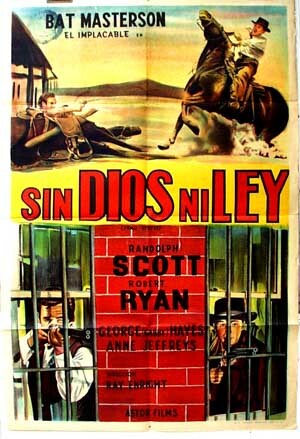 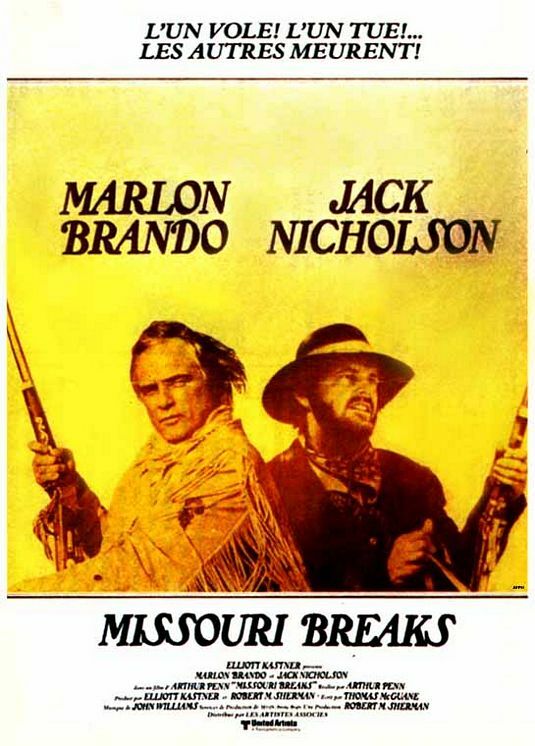 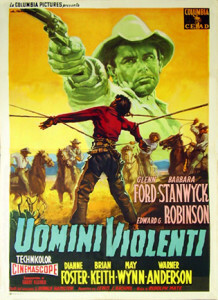 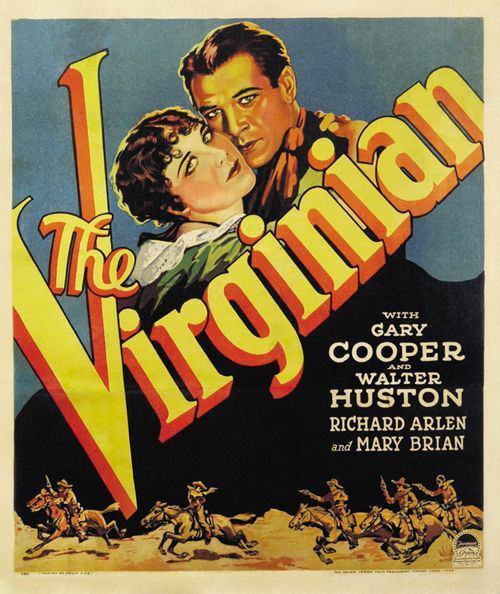 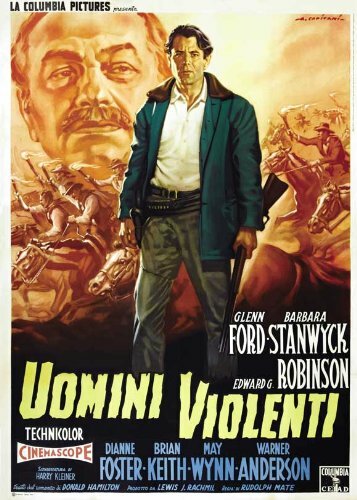 Except for the inclusion of “Texas,” there is little about the alliterative title that signals this is a western. 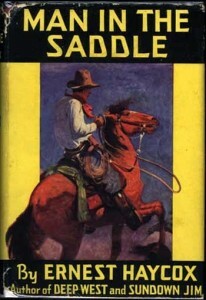 Written by the black-listed Dalton Trumbo, one of the Hollywood Ten, under another name. 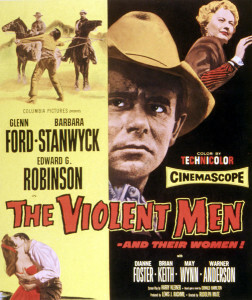 Shot in black and white by Ray Rennahan, at 80 minutes. 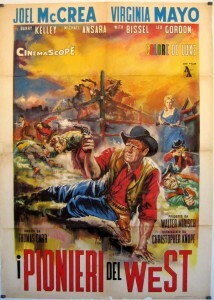 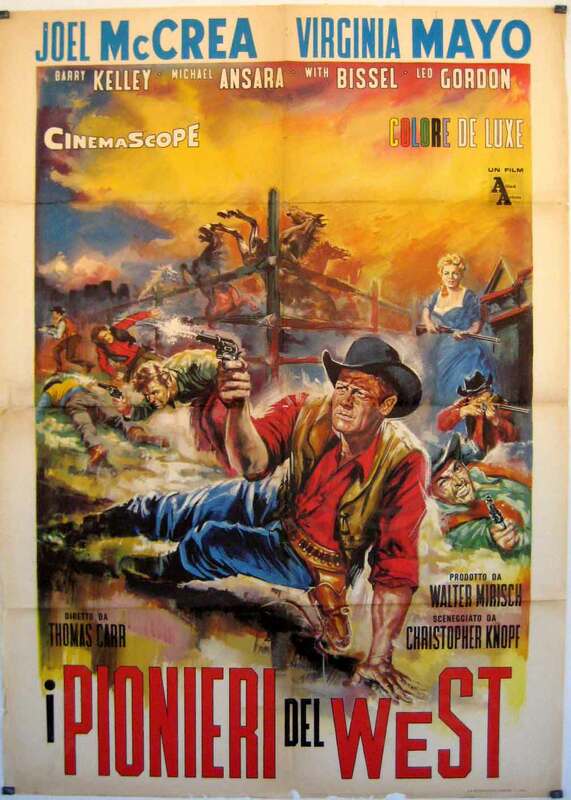 For another Lewis-directed western featuring a gunman with a crippled hand (Randolph Scott this time), see A Lawless Street (1955). 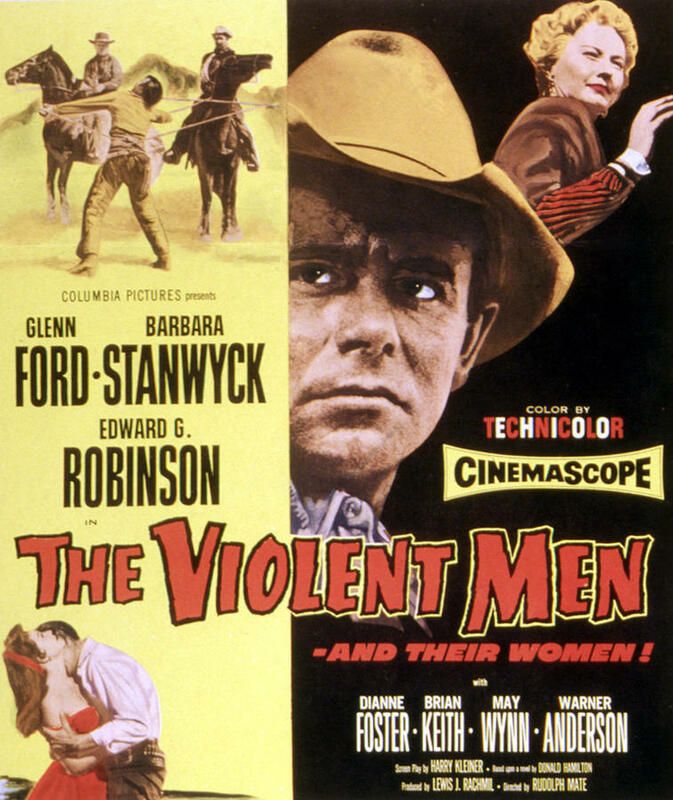 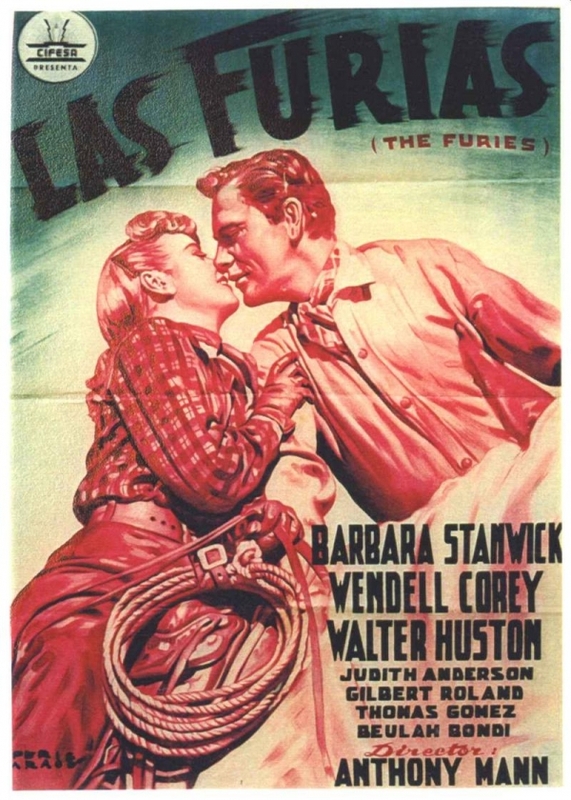 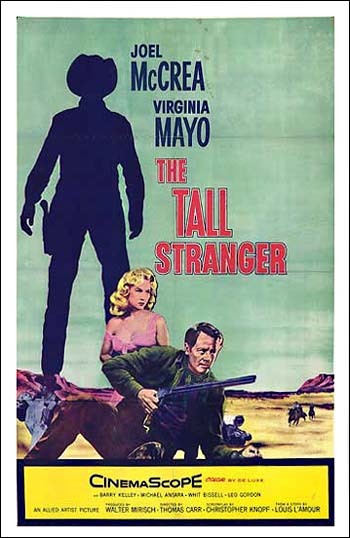 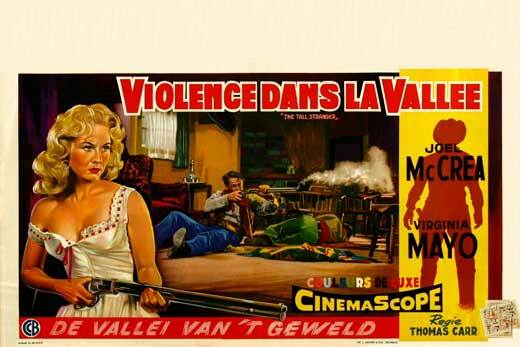 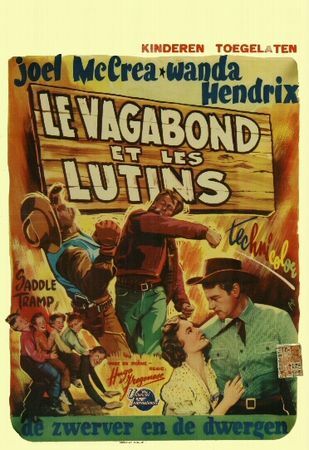 If you’re only going to watch a couple of the eighteen Sterling Hayden westerns, you should try this and Johnny Guitar, neither of which was exactly typical for him. 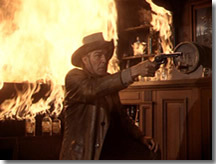 This entry was posted in Westerns Worth Watching and tagged Range Wars, Sterling Hayden on June 15, 2015 by Nicholas Chennault. 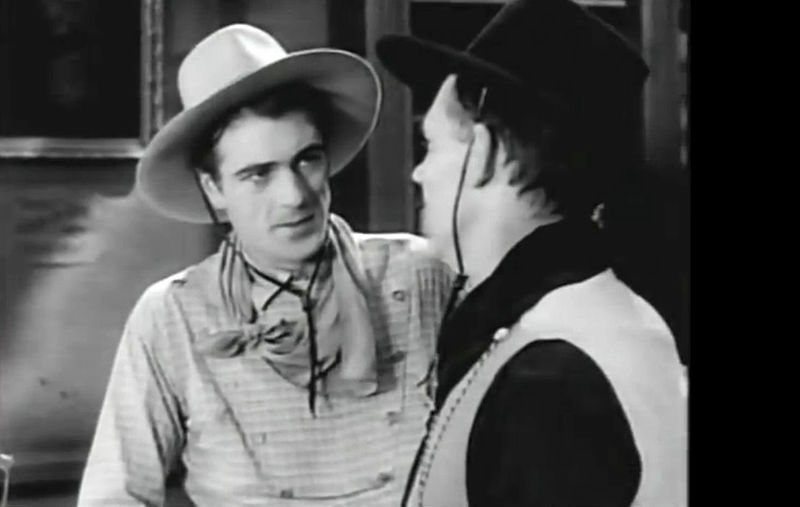 Chuck Conner (Joel McCrea) is the titular saddle tramp, an experienced cowhand heading through Nevada on his way to California. 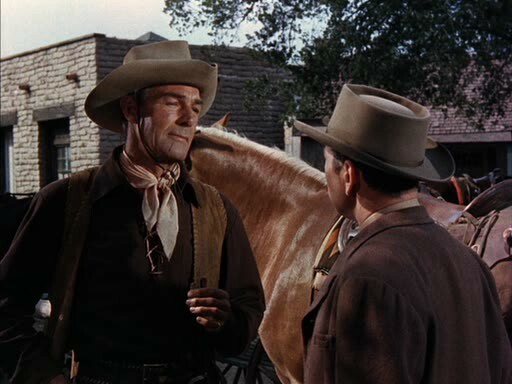 He stops to see Slim Stevens, an old friend with four small boys. 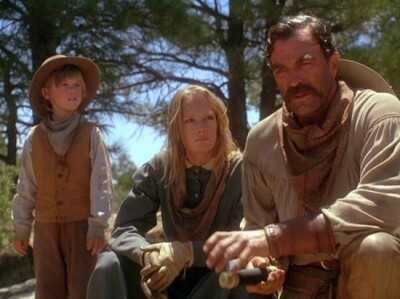 Their mother has been dead a year, and while Chuck is there Slim falls off a horse and breaks his neck. 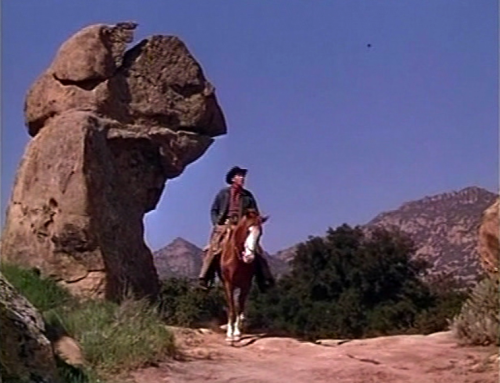 Chuck heads toward California with the four boys in tow. He finds a job at the Higgins ranch, but owner Jess Higgins (John McIntire) doesn’t like kids [a plot contrivance that isn’t terribly persuasive, especially since he’s married to Jeannette Nolan, one of the quintessential mother figures in westerns]. So the kids camp out in the hills, and Chuck takes them food. 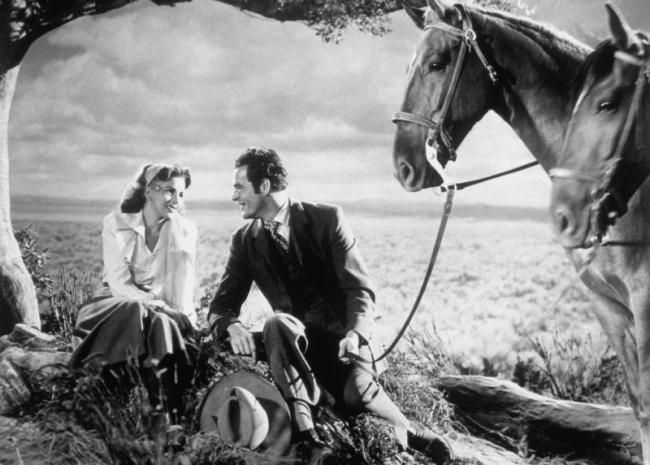 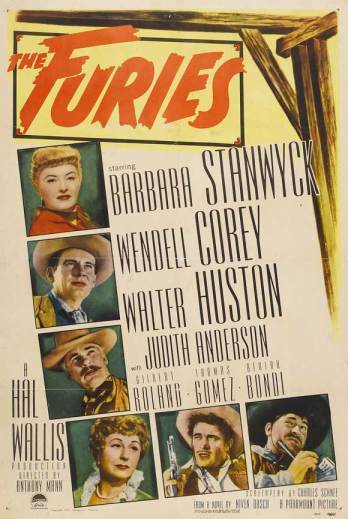 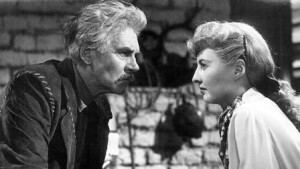 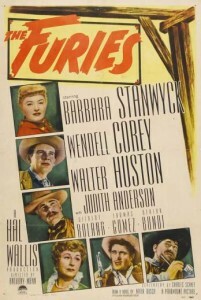 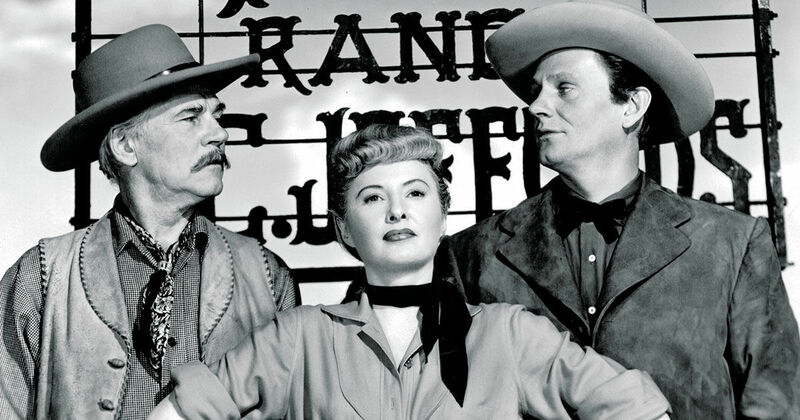 They are joined by Della (Wanda Hendrix), a runaway whose uncle (Ed Begley) has improper ideas about her. 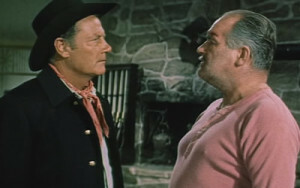 Meanwhile, Higgins is at war with the neighboring Martinez ranch over rustling, and Higgins’ foreman Rocky (John Russell) is developing suspicions about Chuck. 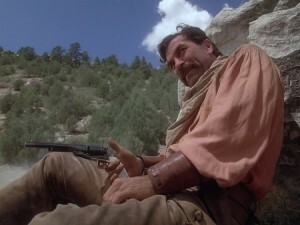 It turns out, however, that Rocky and the Martinez segundo are behind the rustling. 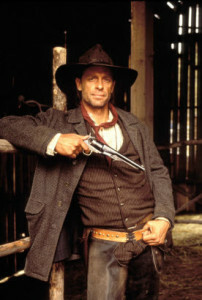 Chuck catches them at it, and they catch him. The kids and Della manage to bring both Higgins and Martinez factions to Chuck’s rescue. 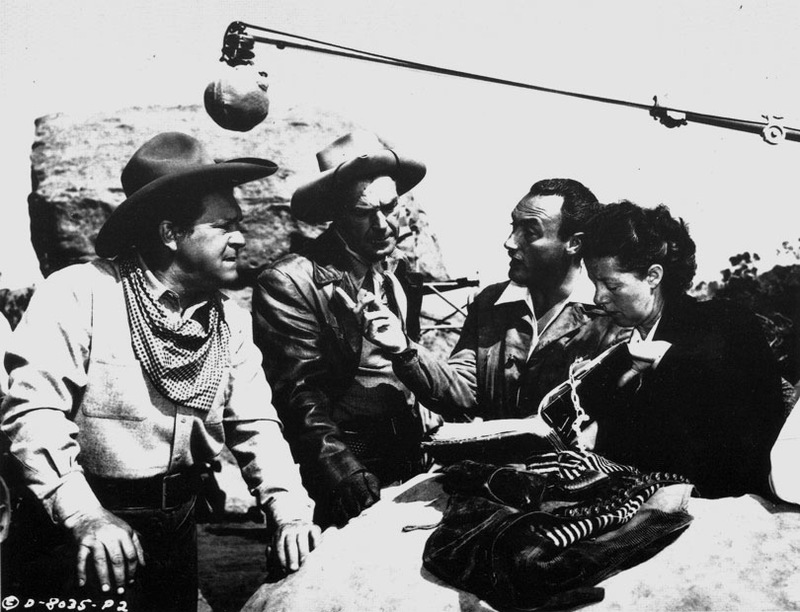 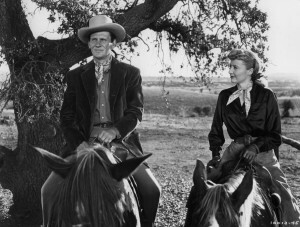 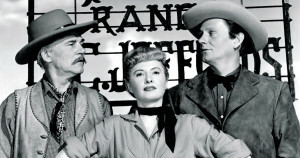 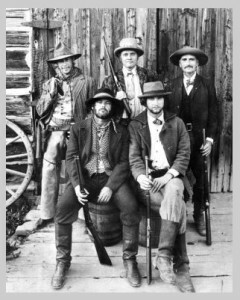 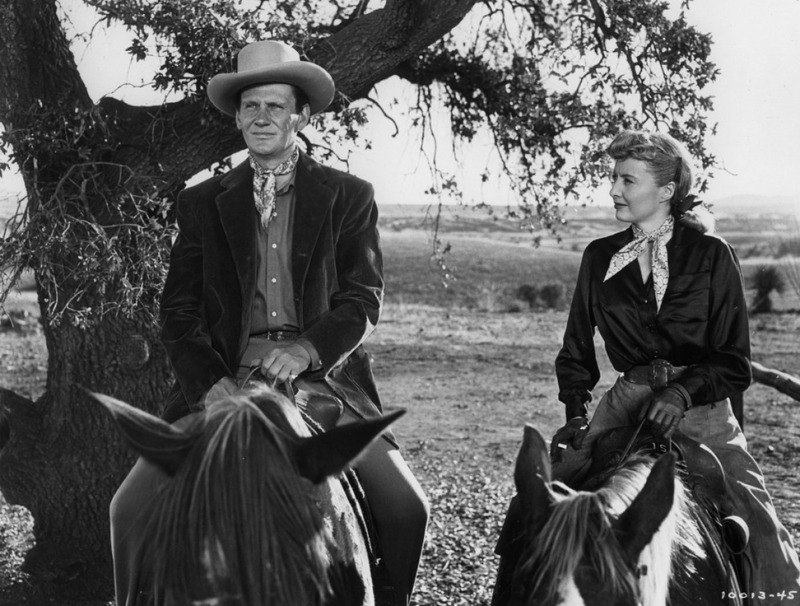 At the end, Chuck appears to have married Della (despite an age difference of some significance) and taken the boys back to Slim’s ranch to try to make a go of it. Pleasant enough fare, if unremarkable. 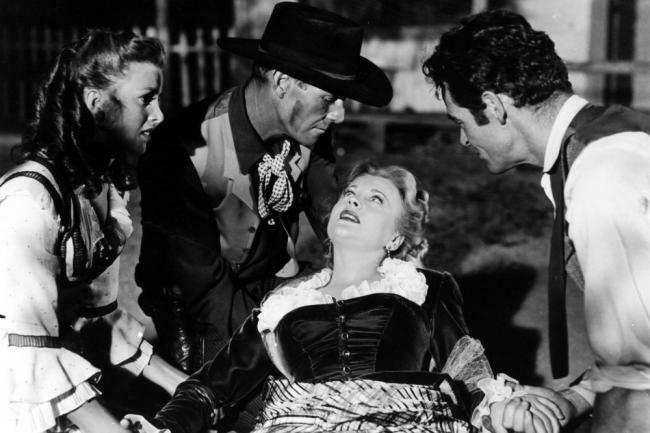 Some plot elements don’t really come together. 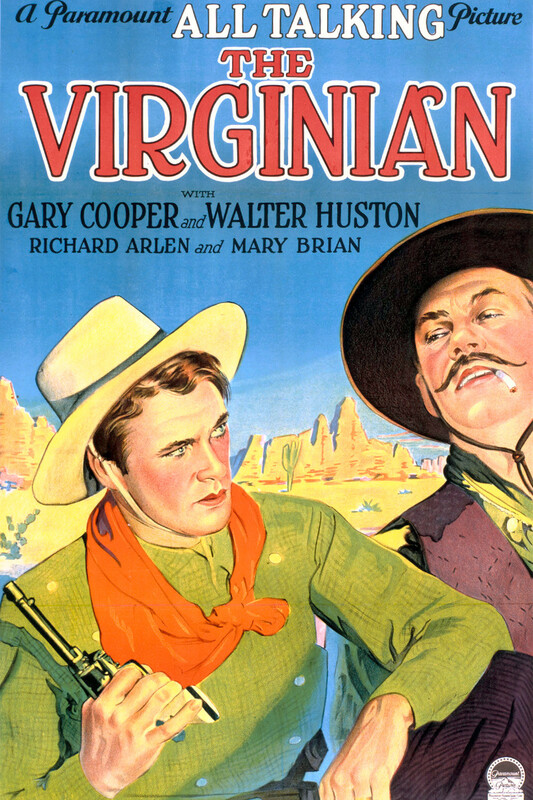 In color, although there appear to be different cuts of it. 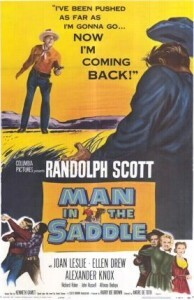 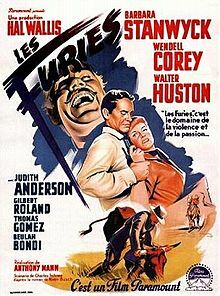 One version is 90 minutes long; the version shown on the Encore Westerns channel seems to be only 74 minutes. 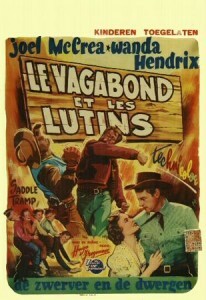 For Wanda Hendrix in another western, see her in The Last Posse. 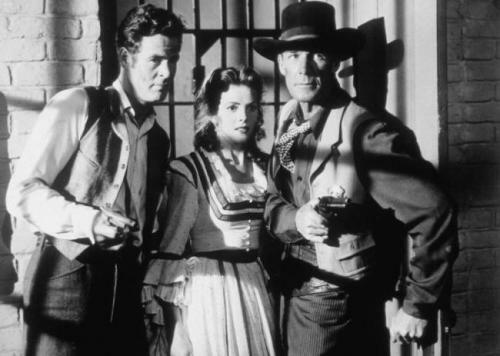 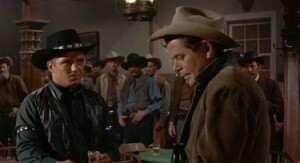 This entry was posted in Westerns Worth Watching and tagged Joel McCrea, Range Wars, The Search for Family on March 20, 2015 by Nicholas Chennault.